This is a newer recipe I picked up last year around this time. A nearby restaurant was serving a salad which included peach, corn, goat cheese, lemon and scallions. It was excellent and they referenced the farm from which the ingredients came. It so happened that we were driving by the farm the very next week on a trip to Michigan. We picked up the same fruit and recreated the salad. Ever since then this salad has been a popular staple of summer cookouts and family gatherings. I never new the exact combination that the restaurant used but it has always been enjoyable, fresh and delicious. Last night I made a slightly updated version that I think is my favorite to date that I would like to share. For this version I did 2 ears of corn, 2 peaches, 1/4 of a red onion, 1/2 of a chile serrano, goat cheese and a vinaigrette made with lemon, honey and olive oil. 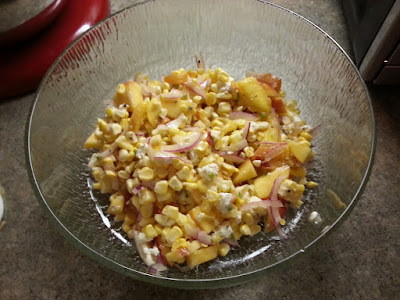 I stripped the corn off of the cob using a knife and cut the peaches into smaller cubes. I added the thinly sliced onion and minced chile. To make the vinaigrette I added the juice of two lemons, honey and olive oil with cracked pepper to a jar and shook until combined. I tossed the salad in my vinaigrette and topped with crumbled goat cheese. The salad was refreshing and I found it difficult to stop eating, it is really that good. 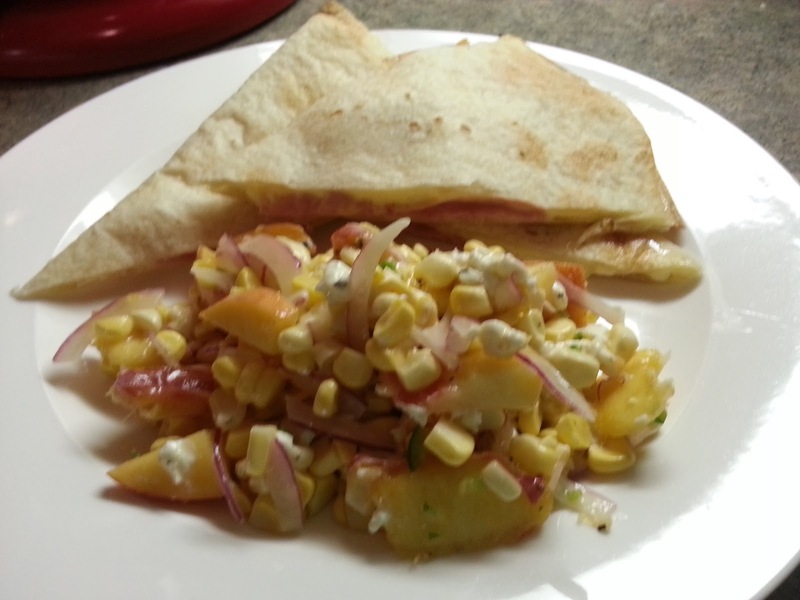 For dinner last night I served it alongside sincronizadas which are simply quesadillas with ham. I would recommend incorporating this salad into your summer repertoire. It goes over very well and is a very fresh and flavorful alternative to a traditional green salad or a slaw. I cat attest to it being not only delicious but also very refreshing! Thanks Vic! glad you liked it. Is the corn raw or cooked? Thanks!